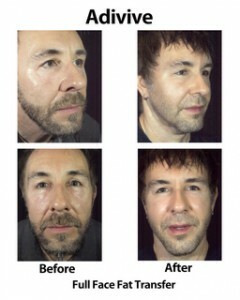 The Stem Cell Facelift: Men Like It, Too! It’s inevitable. As we age, both men and women see our skin begin to lose its elasticity. This can result not only in deepening grooves and sagging jowls (the obvious), but also in loss of volume. Look at photos of yourself when you were 19. Your face looks fuller, because your skin is supported from underneath by youthful, healthy tissue. For the last month or so, we’ve been talking about the Adivive™ fat transfer system — the state-of-the-art technology for harvesting stem cells from your fat to create your own filler. We’ve generated such a buzz – both here in the blog and at our Open House last week – patients and non-patients alike are flocking to Dermess to find out more. And many of those requesting info are men. None of us wants to look like we’ve just come through a wind tunnel after facial cosmetic surgery. But men – even more often than women – are concerned about looking “done”. The stem cell facelift offers a long-term, marked improvement that enhances both skin quality as well as the underlying youthful contours of the face – and gives a completely natural-looking result. The true stem cell facelift is not just about extracting your fat and injecting it back into your face. The stem cells must be harvested by a method that preserves their integrity so they can do what they’re supposed to do – produce growth hormones that “nudge” the skin and fatty layers to generate more of their own cells. The Adivive system utilizes this cutting-edge methodology. When done properly, the stem cell facelift does more than enhance the underlying fatty tissues of the cheeks and the mid-face. The patients we’ve treated have shown marked improvement not only in the underlying soft tissue contours of the face but in the skin’s texture and color. And it keeps getting better. Like the patients in our “after” shots above – they’re practically glowing! Men, what are you waiting for? Make a New Year’s resolution to put your best face forward. If you’re looking for a natural-looking, minimal-downtime solution for improving your aging face, a stem cell facelift may be right for you. Call Tina today at 615-329-3900 to set up an evaluation with Dr. Marvel (or ladies, set up an evaluation for the man in your life!). And don’t forget to follow Gloria’s story in future blogs. This entry was posted on Wednesday, December 14th, 2011 at 10:16 am	and is filed under Fillers and Botox. You can follow any responses to this entry through the RSS 2.0 feed. You can leave a response, or trackback from your own site.